What’s cooking at The Kitchen in Roanoke? The Kitchen may sound like the catchy name for a restaurant. The recently opened Roanoke facility, however, is designed to create food-related businesses, not meals. 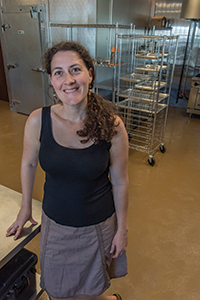 The 769-square-foot facility includes two kitchens that can be rented out separately. They are available 24 hours a day, seven days week. One of the aims of The Kitchen is to help prospective business owners network and find the resources they need to get started. The Kitchen is located in Roanoke’s West End neighborhood, an area of the city considered a “food desert,” with little access to grocery stores. The project received a $25,000 grant from U.S. Department of Agriculture’s Local Food Promotion Program and a $100,000 grant from the Roanoke Women’s Foundation. The facility also received a $20,000 grant from the Virginia Department of Agriculture and Consumer Services with matching funds from Roanoke’s Economic Development Authority as well as other funding.